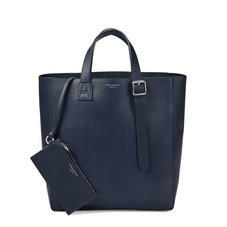 Minimalist design meets modern luxury in our distinctive The Editor's 'A' Tote. Handmade from only the finest Italian calf leather and lined in tactile, tonal suede, the subtle details capture Aspinal of London's dedication to immaculate craftsmanship. The fully adjustable strap is stitched with our signature 'A', while the detachable pouch is ideal for storing a phone, coins and cards. Generously proportioned, it is perfectly poised for both business and weekend wear. Add initials for a unique finesse. 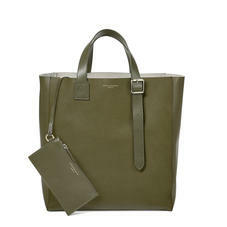 Handmade from the finest Italian calf leather, the minimalist unstructured design of this raw rough-luxe leather tote makes it the ideal companion for work and play. The unlined roomy interior is large enough to accommodate a laptop and has a detachable flat leather pouch for storing notes, coins or your phone. Featuring our iconic "A"stitch detailing and nickel buckles, the fully adjustable top handles of this versatile tote allow it to be carried by hand or worn on the shoulder.